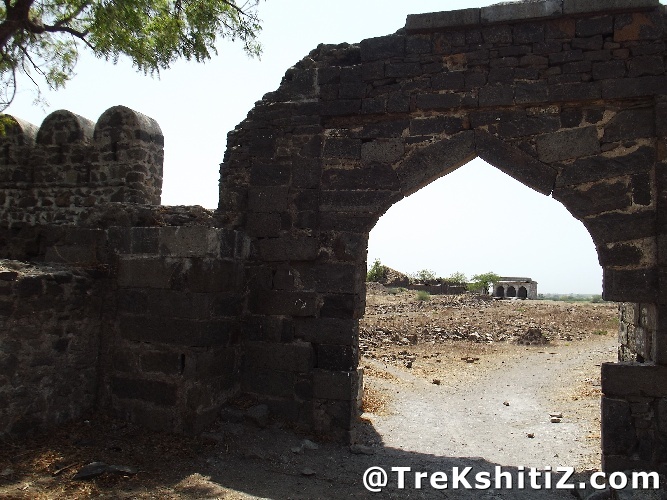 This fort is in Machnur village which is well known by its Siddheshwar temple on the banks of Bhima river. Mughal emperor Aurangzeb had been facing the wrath of the Marathas for quite a long time. It was because of this he built this fort with the main aim of protection from enemies. This fort which was built in 1615 AD had stationed a huge battalion of the Mughal force. Aurangzeb had hosted his court matters in this very fort. There is a local tale linked to the naming of this fort. After capturing the village and nearby areas, Aurangzeb ordered his men to destroy the Shiv Linga but none of them succeeded due to a heavy attack of bees. Furious Aurangzeb later sent beef covered in a cloth as an offering to the Shiv linga as a measure of insult and disrespect. When the cloth was removed the beef turned into white flowers. That�s why it became Maas-Noor and later Machnur. Deeply ashamed by this act Aurangzeb started annually two donations of Rs.400 and Rs.6. Even today the Government of Maharashtra gives an annual donation of Rs.480 to the temple. In order to avoid a direct a on the main entrance door of the fort a wall has been built opposite to it along with two bastions creating a protecting cover. The fort is still in well built condition. There are porches on two sides of the wall on entering the main door and a Mosque to its opposite side. There a water tank carved in stone in front of the Mosque and to its back is the deep basin of Bhima river. The fortification alongside the river has been devastated due to flooding of the river. On entering the village one can find the Siddheshwar Temple complex built in black stone which resembles the temple of Tuljapur. There are two porches on either sides of the main door and further the big stairs lead us to the second doorway. In the walls of this door one can find two carved stones known as Veerghal. There is a statue of Nandi of approx 3 feet in the temple. Further two doorways lead us to the Shiv linga of which the first door is 5 feet in height and the second door is of 2.5 feet which is almost like a window. There is a spacious arcade behind the temple built on the river bank. Machnur village is 43 kms from Solapur and 21 kms from Pandharpur on Solapur � Pandharpur road, while its 12 kms from Mangalvedhe. The road in the village which takes us to the temple complex first further leads to the fort where the road ends.